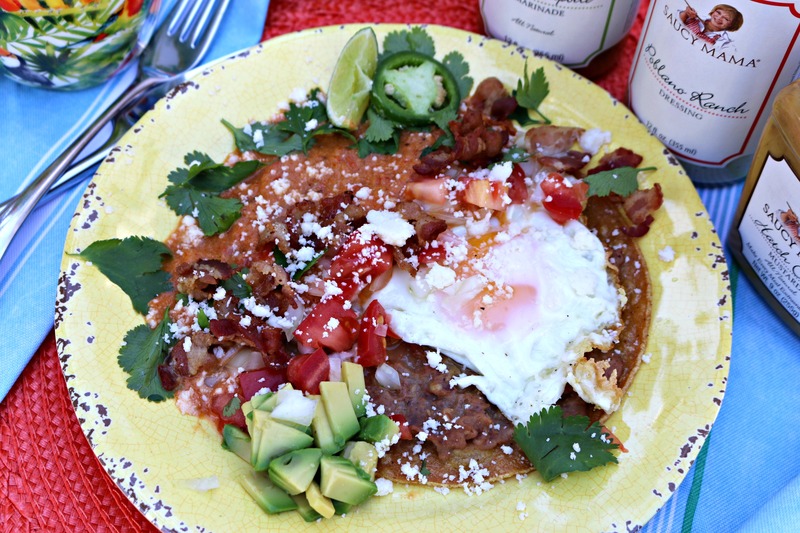 Huevos Rancheros is an easy Mexican breakfast recipe. It is a cinch to make, and packed with authentic Mexican flavors. The Saucy Mama Recipe Contest is a Super Qualifier for the World Food Championships held in Orange Beach Alabama November 7-14, 2017 and is sponsored by Barthyte Foods. This will be my third year competing for a spot on Team Saucy Mama for the Bacon World Food Championships Category. One of the most competitive and highly regarded contests in the food sport world, this contest is also one of the hardest to win. Sadly, there is only one spot available on the Team Saucy Mama, and this year, a mix of twenty-five professional and home cooks competing for the coveted position. Words cannot express how badly I want to earn that last spot. Now it’s up to the panel of judges to cook the 25 submitted recipes and choose a winner. My Saucy Mama inspired Huevos Rancheros is a cinch to make and packed with authentic Mexican flavors. 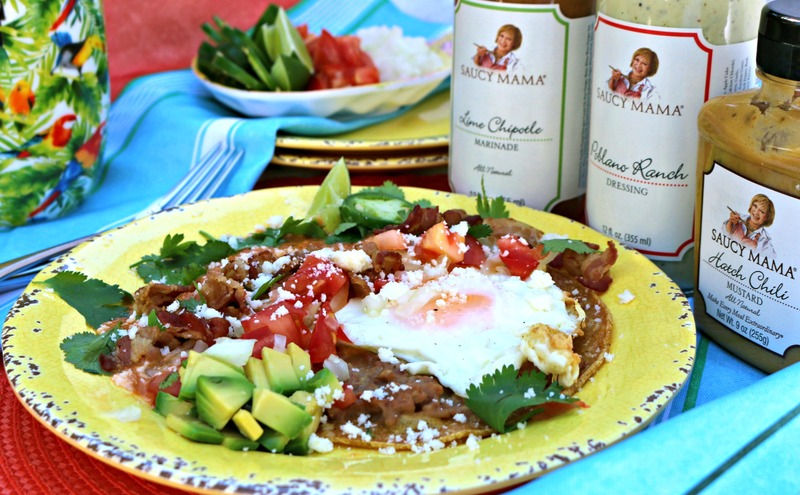 By utilizing three (3) Saucy Mama products there is no need to use dried adobo chili as called for in traditional huevos rancheros recipes. Poblano Ranch Dressing, Lime Chipotle Marinade, and Hatch Green Chili Mustard bring all the traditional flavors of Mexico, and more. Adding more dimension to the dishes flavor profile the recipe is balanced by the smokiness and crunch of BACON. The recipe can be made for a family of four (4) or easily double or tripled for a crowd. When making the dish for a large group, prepare the bacon-refried beans and the ranchero sauce the day before. Just reheat these components while cooking up the tortillas and fried eggs. It’s as easy as that! 1. For the ranchero sauce: Preheat the oven to broil (550) F. and put the tomatoes, peeled garlic cloves and onion on a parchment lined, rimmed baking sheet. Roast the vegetables, turning occasionally, until blistered and charred in spots, about 10 minutes. Watch closely to keep from burning vegetables. 2. While the vegetables are charring: rough chop bacon and cook in cast iron skillet over medium high heat until crisp. Turn off the heat. Remove ½ the cooked bacon to a plate and set aside for garnish. Leave the remainder in the pan and scoop to one side of the skillet. Using a large chef spoon, remove 2/3 of the hot bacon fat and evenly distribute between the second cast iron skillet and sauté pan. (second cast iron skillet is for frying tortillas and eggs and sauté pan is for cooking ranchero sauce) Add 2 tablespoon Saucy Mama Hatch Green Chili Mustard and 2 tablespoons water to the cast iron pan with the cooked bacon. Return to heat, and cook stirring for 2 minutes to deglaze the pan. Turn off the heat and set aside until ready to make the refried beans. 3. Continue with the ranchero sauce: put the charred vegetables and any juices from the baking sheet into the large mixing bowl with ½ cup Saucy Mama Lime Chipotle Marinade, ¼ cup Saucy Mama Poblano Ranch Dressing,1/4 cup water, ½ teaspoon salt and blend with an immersion blender until fairly smooth. If you don’t have an immersion blender use a standing blender with tight fitting lid. Taste; stir in more Saucy Mama lime chipotle marinade for a spicier sauce. 4. Heat the tablespoon reserved bacon fat and 1 tablespoon oil in the medium sauté pan, over medium heat. Add the ranchero sauce, and cook stirring, until thickened but pourable, about 5 minutes. NOTE: The sauce will splatter when it hits the hot fat so use caution. Taste and season with salt as necessary. Cover and keep warm over low heat. If the sauce thickens too much, add 1 tablespoon of water at a time to thin it out. 5. For the refried beans: Return the cast iron skillet with the chopped bacon to medium heat. Pour half the bean liquid into a small cup and reserve for later. Add the beans to the medium mixing bowl with about half of their reserved liquid and mash with a potato masher until smooth, then add the mashed beans, 2 tablespoon Saucy Mama Hatch Green Chili Mustard, ¼ teaspoon salt to the cast iron skillet, and mash again until smooth. Mixture will be bubbly hot. Cook, stirring and scraping with a wooden spoon, until heated through. As beans cook with bacon they will become thick, add some more of the reserved liquid until they are creamy. Taste, season with salt if necessary. Using the immersion blender, blend beans and bacon until smooth adding more liquid if necessary, and cover and keep warm over low heat. 6. If making ahead for a group, this is the time to cool the cooked components and refrigerate in sealed containers. Reheat the components the following day while you are making the tortillas and eggs. Be sure to add a few tablespoon water to the beans before reheating. 7. For serving: Preheat the oven to 200 degrees F and line a baking sheet with parchment paper. Heat the bacon fat in the second cast iron skillet over medium high, and add 1 teaspoons vegetable oil. Add 1 tortilla and cook until soft, about 15 seconds. Flip the tortilla with tongs and continue to cook about 15 seconds. NOTE: Tortillas are not fried crunchy, they are cooked just to tenderize and heat through. Remove from the pan and arrange in single file to the lined baking sheet. Repeat with the remaining 3 tortillas, adding more oil if necessary. Spread about 2 tablespoons of the refried beans on each tortilla and keep warm in the oven. 8. Using the same cast iron skillet, heat 1-2 tablespoon bacon fat or oil, about 1 minute. Crack 1 egg at a time into the skillet and cook until the edges are crispy and whites are almost set (about 30-45 seconds) Ladle or scoop hot oil over the top of the egg for 1 more minute. 9. Remove the tortillas from the oven, top tortillas with an egg, then return to the oven and repeat process until all eggs are cooked. Top the remaining tortillas with the remaining eggs. 10. For Garnish and Build: Sprinkle each with a pinch of salt, some ranchero sauce, Cotija cheese, reserved crumbled-cooked bacon, chopped avocado, cilantro, sliced jalapenos, chopped tomato, and chopped onion. I hope you enjoy this Huevos Rancheros recipe! – $1000 Travel Stipend to help winner get to Orange Beach for the WFC event (Nov. 8-14) which will be awarded onsite at the WFC. – MAJOR bragging rights, and the opportunity to compete against other cooks (and possibly win massive cash and/or even a TV spot) at the invitation-only WFC event. Visit Barthyte Foods today to order these three delicious products to make my huevos rancheros recipe. Follow Saucy Mama on Facebook to stay up to date on all #TeamSaucyMama news and happenings at WFC 2017.